Grilling fish over a campfire is great, but turning it into fish tacos is even better. 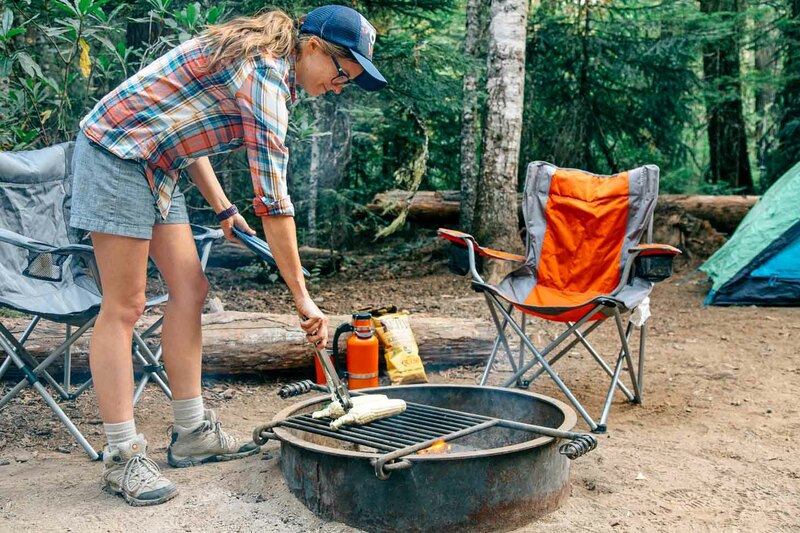 As the summer camping season starts to wind down, we make a point to soak up as much of the warm weather before it’s gone. So on a clear sunny day, we loaded up the car and made an impromptu trip up to the Mt. Hood area. This part of Oregon is home to a couple of our all-time favorite campgrounds in the entire country: Trillium Lake and Hoodview. Unfortunately, we weren’t the only ones trying to enjoy the last of the summer, so we had to divert to a nearby alternate along the shores of Timothy Lake. 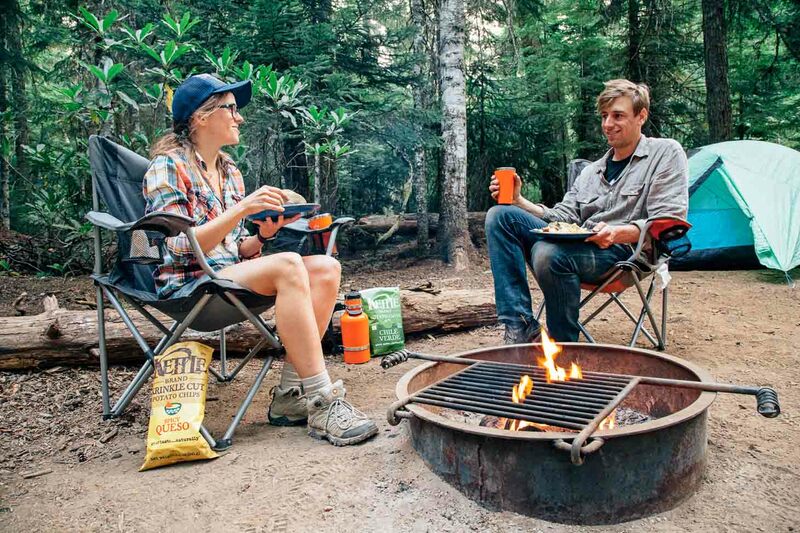 Thankfully, in this neck of the woods, there’s no such thing as a bad campsite! For dinner, we were going to make grilled fish tacos over the campfire. If we had to choose a meal that captures the essence of summer, fish tacos would definitely be high on our list. 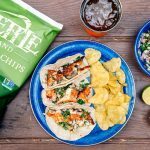 While we have previously tried our hand at making Baja-style fried fish tacos, on this trip we wanted to go with something a little more streamlined. Fried fish is great, but the flour, egg wash, panko and pan full of scalding hot oil does require a level of bullish commitment we just don’t possess this late in the season. For maximum flavor with minimum effort, grilled fish is definitely where it’s at. Since we were going to be seasoning the fish, we opted for a light white Pacific Snapper. We also picked up corn on the cob, red onions, cilantro, and a jalapeño to make a spicy corn salsa. At the campsite, we got the fire started and tossed on the corn and jalapeño. While those were working up a nice flame-roasted char, we turned our attention to preparing the fish. We squeezed a half lime over the fillets, covered them with olive oil, and salted liberally. We then dusted the fillets with chili powder and cumin. In terms of grilling the fish, we decided to pick up an inexpensive campfire broiler basket. It’s essentially a wire frame basket that opens up like a clam shell with a long metal handle on the end. The fish goes inside the basket and the whole thing gets placed over the fire, making it much easier to flip. While it is technically possible to grill fish directly on a grill grate without it sticking, a very clean and well-oiled grate is needed. We’ve seen a lot of campfire grates over the years and “clean” is not a word we’d used to describe most of them. “Soot-encrusted” or “carbon-caked” maybe, but definitely not clean. So for a few dollars, we picked up the wire basket and saved ourselves from almost certain disappointment. When the corn and jalapeño were done cooking over the fire, we took them off and moved our fish basket into position. We were going for medium heat, but with an open fire, figuring out the exact cook temperature can always be a bit of guessing game. So we just kept an eye on it. While the fish cooked, we shaved off the corn kernels, peeled and minced the blackened jalapeño, diced up the red onion, and chopped the cilantro. We mixed all this together into a bowl with some lime juice, which would serve as our base layer in the tacos. Back on the fire, we waited for the fish to start to crisp up slightly before we flipped it. The second side of the fish takes half as long to cook as the first, so we took this opportunity to warm up our tortillas over the fire. This way they’d be ready to go as soon as the fish came off. Once removed from the fire, the fish needs to rest for about 2-3 minutes. (Coincidently, this is exactly how much time it takes to prep your plates with the tortillas and spicy corn salad.) Once our tortillas were ready, we cut up the fish fillets and served with a side of potato chips. 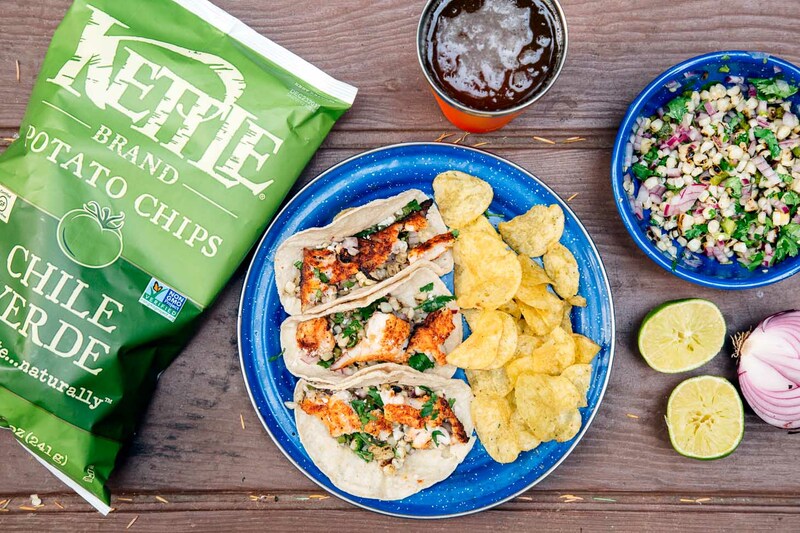 “Potato chips?” you say, “Wouldn’t fish tacos be better with tortilla chips or something?” We hear you, we hear you. Not too long ago, we might have had the same reaction. But these aren’t any old potato chips. These potato chips are special. 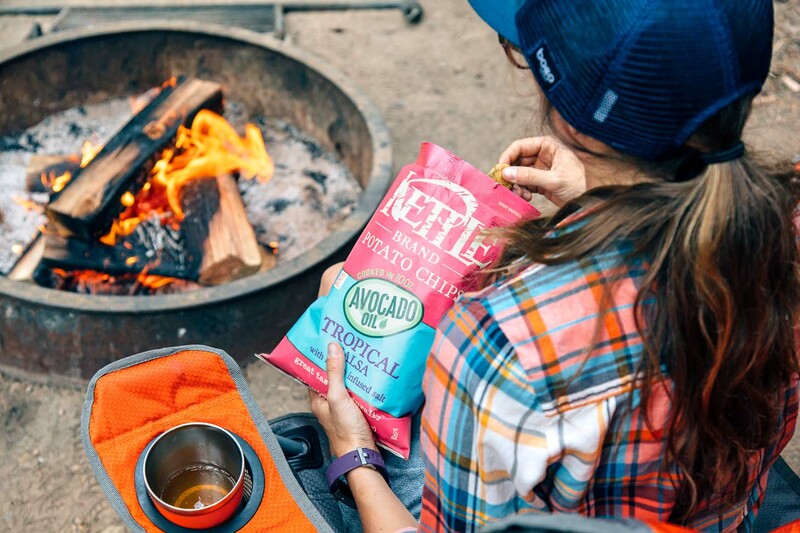 We’ve always liked Kettle Brand chips, as you know, potato chips. Something we’d pick up at a deli to go with our pastrami sandwich. But recently Kettle has been taking their potato chip game to a whole new level. This season, they are launching three new flavors: Tropical Salsa, Spicy Queso, and Chile Verde. Honestly, we didn’t know how good potato chips could be until we tried these flavors. Bright, tangy, and spicy: we’d be happy to serve these chips next to our tacos any day of the week. 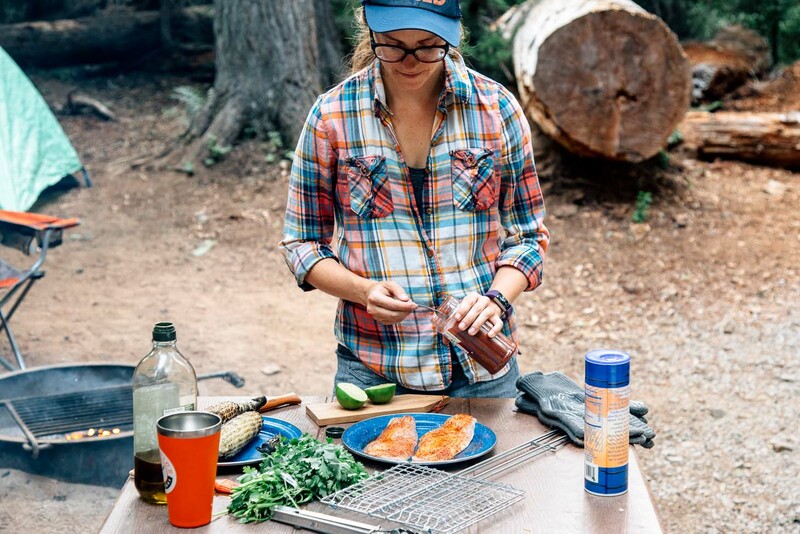 So if you’re in the mood for a quick and easy campfire fish tacos, this recipe is for you. 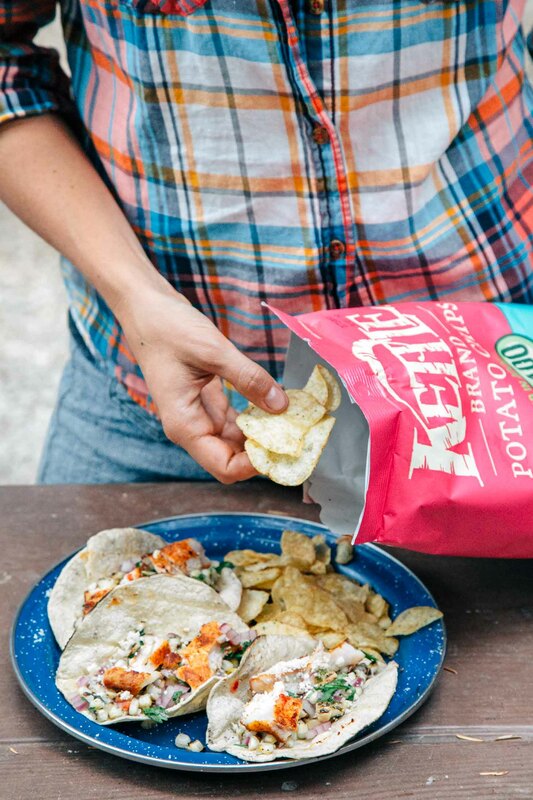 And if you’re looking to get in early on the 3rd wave potato chip movement, Kettle is your brand. Start your campfire or grill - you'll be cooking this meal over medium-high heat. Prep the fish by squeezing half a lime over the fillets, a drizzle of olive oil, and dusting both sides of the fish with the chili powder, cumin, and salt. Set aside. Once your fire is ready, place the corn and jalapeno on the grill. Grill for about 10 minutes, turning occasionally, until tender. Remove and set aside to cool slightly. Place the fish in a wire grill basket. Place on the grill and cook for about 3 minutes, then flip and cook 2 minutes more. Remove and let the fish rest for a minute or two. While the fish is cooking, make the salsa. Cut the corn off the cob, peel the blackened skin off the jalapeno and chop (remove stems & seeds for a milder spice), finely chop the onion, and mince the cilantro. Place everything in a bowl and squeeze in the juice from half a lime. Add salt to taste. Build your tacos with the warmed tortillas, corn salsa, fish, and avocado. Serve with a side of Kettle chips and enjoy! These look really good! Love the corn salsa as well! Good Job. This looks amazing! 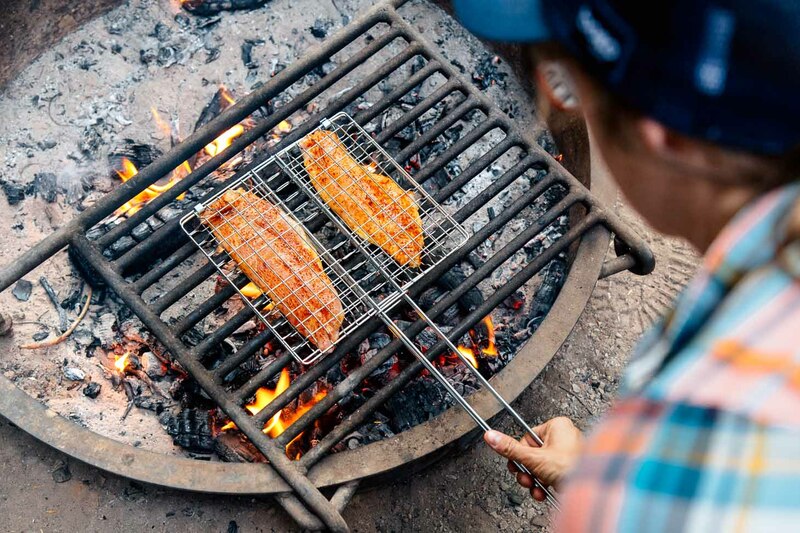 Added to the list for out next camping trip, gourmet camp food, who would have thought!